As Keynes’ biographer, Professor Robert Skidelsky, says in the British Sunday papers, “it is not surprising that the old Keynesian tool kit is being ransacked” in response to the global economic crisis. After decades of being assured that “there is no alternative”, and that Keynesian economics is a dead duck, we now find that Keynesian remedies are all the rage. Without government intervention to bail out failed banks, measures of counter-cyclical demand management, and the resurgence of fiscal policy, the world would be facing an even grimmer future than it currently is. But we need not wait long for the failed nostrums of recent orthodoxy to re-surface. Already, the George Bush’s of this world are trying to re-write history. The crisis, they say, was not caused by the failure to regulate the “free” market. There is nothing wrong, they maintain, with the basic model of unregulated capitalism. All that is needed, once the current crisis is overcome, is a little tweaking here and there before business as usual is resumed. These apologists for our current travails make it clear that the measures that their failures have made necessary are absolute anathema to them. According to them, the best thing that can now happen is that decisions on major economic issues should be returned as soon as possible to those who are accustomed to taking them – that is, to those who made these catastrophic mistakes in the first place. What all this shows is that the response demanded by the crisis is as much a political one as it is economic. The economics are pretty straightforward, as Keynes himself would have argued. In his view, economics was not an arcane science but largely a matter of common sense. It does not require a genius to understand that short-term markets are inherently unstable and, without proper regulation, will topple over into disaster. Nor do we need to look far for the obvious (even if – to some – unpalatable) remedies for the financial meltdown and the imminent global recession. What we do need to understand is that what creates a crisis of the kind that now engulfs us is not economics but politics. 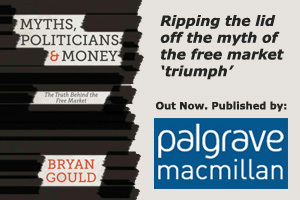 The triumph of the global “free” market which has dominated the world over the last three decades has been a political triumph. It has reflected the dominance of those who believe that governments (for which read the views and interests of ordinary people) should be kept away from the levers of power, and that the tiny minority who control and benefit most from the economic process are the only people competent to direct it. This band of greedy oligarchs have used their economic power to persuade themselves and most others that we will all be better off if they are in no way restrained – and if they cannot persuade, they have used that same economic power to override any opposition. The so-called “economic” arguments in favour of “free” markets are no more than a fig leaf for this self-serving doctrine of self-aggrandisement. It is that political stance that must now be challenged if we are to learn the real lessons of the current crisis and defend ourselves against a repetition of the disaster that has now overtaken us. What we must understand is that what has happened is not the consequence of some technical failure in economic management. It has happened because we allowed democratic forms of government to be sidelined and subverted by the economic power of a minority. The uncomfortable truth is that democracy and “free” markets are incompatible. The whole point of democratic government is that it uses the legitimacy of the democratic mandate to diffuse power throughout society rather than allow it to accumulate – as any player of Monopoly understands – in just a few hands. It deliberately uses the political power of the majority to offset what would otherwise be the overwhelming economic power of the dominant market players. If governments accept, as they have done, that the “free” market cannot be challenged, they abandon in effect their whole raison d’etre. Democracy is then merely a sham. The dice must then be allowed to lie where they fall, and no amount of cosmetic tinkering at the margins will conceal the fact that power has passed to that handful of people who control the global economy. The challenges facing the world are now so great – the threat to our environment, the huge imbalances between rich and poor, the energy crisis – that they dwarf even the economic power of the high priests of the global economy. If the current crisis is to be overcome successfully, it must set us on a new course, not just to restore prosperity for the already well-off, but to confront these global challenges before it is too late – and that is a task not just for the economists but for the politicians – and all of us – as well. This article was published in the online Guardian on 26 November.